What's the earliest Windows NT we know about? Just been watching the video Microsoft did in 1991, and when Bill Gates comes to showing us Windows NT I saw - to my surprise - that it's showing a build number that looks like either 125 or 175 (see picture), and that got me wondering... I know we've got the October 1991 build (I'm QEMU'ing it on my laptop right now), but do we know anything about any earlier builds of it? Actually, if you remember, linuxlove posted that video about a year and a half ago. Still, though, it was very interesting to see nonetheless. Anyway, from what I've heard, earlier builds were known as NT OS/2 3.0, before finally being renamed to Windows NT (possibly first to 3.0, certainly it was 3.2 at some point, and then finally it was 3.1 in the end). They were first designed for the Intel i860, before finally being ported over to the Intel 386 and 486 processors (and also the MIPS/R3000/R4000 systems). I've even heard that early development was done from within OS/2 1.2 within a simulator designed to accommodate the then-i860-only software product while it was still in its early stages of development (back when it was still known as NT OS/2). Also, it was OS/2 1.x that first introduced CMD.EXE; apparently, it was ported over to NT OS/2 (later Windows NT). Yeah I know that... well knew most of it anyway heh heh. I was asking if anyone has any information on specific builds or whatever, wondering if we'll ever see the January 1991 build for example. Oh. I haven't been around for a while. Somewhere in the island that is formerly a U.S. colony. Thanks, I couldn't make it out. Still wouldn't mind getting more information on pre-Comdex NT though. I'm going to work on the assumption that if it was compiled, there must be a copy somewhere. EDIT: Is it possible to get that version info to display on my copy of Oct-91? Even Wikipedia has some interesting information about the development of NT OS/2, and probably also other sites have some information about it. Personally, I've heard about some Build 102 of Windows NT 3.0, possibly from around January 1991, that Namronia found out about from some Microsoft support worker, and was "very unstable" as they said it. I've also heard about some Windows NT build from louisw3; apparently, it was very similar to the October 1991 build, only it was released in August, and still had several references to the old NT OS/2 name in some places, but installed the same way nonetheless. Yeah, I've read the Wikipedia entry on it What does louisw3 know? Does he have copies of it, or was he a tester/developer or something? Whoa, people are still talking about Namronia? I thought he'd vanished years ago! Would be interesting to find something from when it first took on the Windows look and feel. What the SDK felt like, blah blah. Namronia has returned, but he doesn't really post that often. Still though, that's not the point at all, my point was just that some people seem to have some information regarding builds of Windows NT 3.x that are even earlier than the October 1991 build that we happen to have available here. It is possible, only in the checked version, the one in the video is the checked version. SAN FRANCISCO -- At the announcement of the MIPSR R4000TM RISC processor Tuesday, Microsoft executives provided a technology demonstration of the MicrosoftR Windows NTTM operating system on a MIPS R4000-based system. 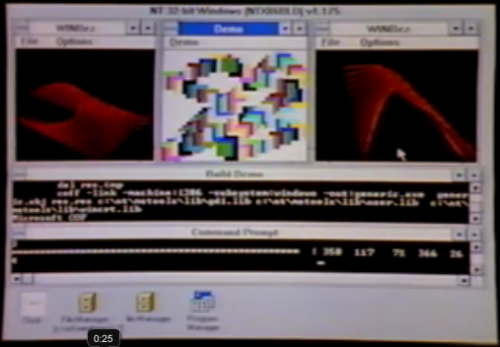 Today's demonstration was the first public viewing of the Windows NT operating system on a RISC (Reduced Instruction Set Computing) system. Both the MIPS R4000 RISC processor and the Microsoft Windows NT operating system under development are supported by the Advanced Computing Environment (ACE) initiative, which includes companies such as Compaq, Digital Equipment Corp., MIPS, Microsoft, The Santa Cruz Operation (SCO) and more than 200 other companies. Microsoft has committed to offering Windows NT on both platforms supported by the ACE initiative: R3000R/4000 systems based on the MIPS ARC specification and IntelR 386TM/486TM architecture-based systems. Windows NT is a new, advanced version of the Microsoft Windows operating system that is designed for higher-end machines. Windows NT provides full Windows application compatibility in a robust, complete operating system. This future product complements today's combination of Windows and the MS-DOSR operating system; Microsoft expects these systems to coexist and reinforce each other. In addition, Windows NT is a fully protected 32-bit system that will include advanced features such as: preemptive multitasking, certified security, integrated networking, support for symmetric multiprocessing and support for high-performance and high-capacity I/O. An early prerelease version of Microsoft Windows NT is being tested currently by a small group of software developers. As functionality is added to the prerelease version, Windows NT will be made available to additional developers in stages. Full beta testing will begin in the first half of 1992, with finished software scheduled to be available in the same year. Microsoft Corp. (NASDAQ: MSFT) develops, markets and supports a wide range of software for business and professional use, including operating systems, network products, languages and applications, as well as books, hardware and CD-ROM products for the microcomputer marketplace. Note to Editors: As used herein ``DOS'' refers to the MS-DOS and PC-DOS operating systems. Microsoft and MS-DOS are registered trademarks and Windows and Windows NT are trademarks of Microsoft Corp. Intel is a registered trademark and 386 and 486 are trademarks of Intel Corp. MIPS and R3000 are registered trademarks and R4000 is a trademark of MIPS Computer Systems, Inc. Need disks scanned in the USA? I have a Kryoflux, and am willing to help get your disks archived! I also offer xbox and xbox 360 repair and modding services. PM me for details! The book showstopper gives the impression that the NT team had not achieved the goals of being able to run simple OS/2 programs just before the decision was made to dump the 'Cruiser' (aka OS/2 2.0) personality and instead grab the WLO (Windows ported to OS/2 team) and see about porting & extending Windows onto the NT kernel. It is unclear just how far they had gotten, perhaps the 16bit OS/2 subsystem was already done? Is the Presentation Manager for NT as far as they had gotten with the GUI? As far as I'm aware, none of the NT OS/2 stuff ever made it outside of Microsoft as it was incomplete. The only 'publicly available' 1991 CD-ROMS were the October (COMDEX) and December pre-releases. Anything else would require someone who had internal access, which I doubt we'll see anytime soon. Whether OS/2 3.0 lives up to its promise ultimately depends on one man --David Cutler. The man who designed Digital Equipment Corp.'s (DEC's) RSX-11 and VMS operating systems is trying to work magic again, this time on desktop machines as powerful as VAXes but infinitely less expensive. At 49, Cutler doesn't look like the hacker-emeritus type. He looks more like a lifeguard than the code inspector for the most ambitious programming project in Microsoft Corp.'s history. Cutler's assignment -- known as OS/2 3.0, or Portable OS/2 -- will run DOS, OS/2, Windows and POSIX-compliant applications independently of one another. Its 50K-byte kernel, called the Executive, controls all of the OS/2's most basic functions, an architecture that Cutler hopes will accommodate future I/O, file system or display technology not even on today's drawing boards. Microsoft is betting Cutler has both the technical vision and the managerial discipline to pull off this daunting programming task. As part of his responsibilities, Cutler chairs a monthly update meeting in which project leaders report coding progress as well as new challenges lying ahead. He also charts OS/2 3.0's advances with IBM officials once a month. "When it comes to keeping on schedule, he's the least tolerant individual I've ever met," said Steve Ballmer, Microsoft's senior vice president of systems, in Redmond, Wash.
"I like doing technical work," Cutler said, and he likes doing it in a low-key environment. In 1988, when the colliding VAX and PC worlds took the fun out of his job at DEC, Microsoft jumped in with big money, an impressive title (director, advanced operating system development) and autonomy over the then-secret OS/2 3.0 project. Cutler's experience with MIPS Computer Systems Inc.'s RISC chip architecture, which DEC had licensed from MIPS, gave him a head start in porting OS/2 to chips other than Intel Corp.'s. MIPS systems are one of the first targeted platforms for running OS/2 3.0. "You can't take DOS and run mainframe applications on it, but it's clear that in 10 years' time, everything is going to slide off the mainframe to the PC," Cutler said. The entire OS/2 3.0 team -- 85 engineers in all -- report directly to Cutler. Software Development Kits (SDKs) for the operating system are on schedule for fall release, he said, and full-blown applications are due to be released a year from now. The project's "base team," which wrote the Executive, recently linked their code with the "Windows team," which had begun crafting OS/2 3.0's graphical user interface, also based on Windows. By summer, the two groups' code, along with other components, will be sewn together, debugged and offered to developers in beta-level SDKs. Cutler said he has had trouble adjusting to "the very, very young" people of Microsoft. "They know all about PCs, but they don't know much about the older technologies that set the stage for what we now have today," he said. Nevertheless, DEC's most notable PC refugee is happy with his choice. "I expected to come here to do something, and though it got reshaped along the way, the goal is the same as it was two and a half years ago." This article gives at least a little more insight into the timeline of NT development. Looks like it was mid-1991 when the kernel was matched up with a GUI. Hmm June of 1990 they were already talking about what would be involved in cutting PM (OS/2) lose. Stephen Elop….I curse you, that after your death your soul will be forever trapped in the sourcecode of Windows and one day Microsoft will fall because of that virus code!